Shakti is a Sanskrit word meaning “Power” according to the Yoga Journal list of the 40 most common and important Sanskrit words. 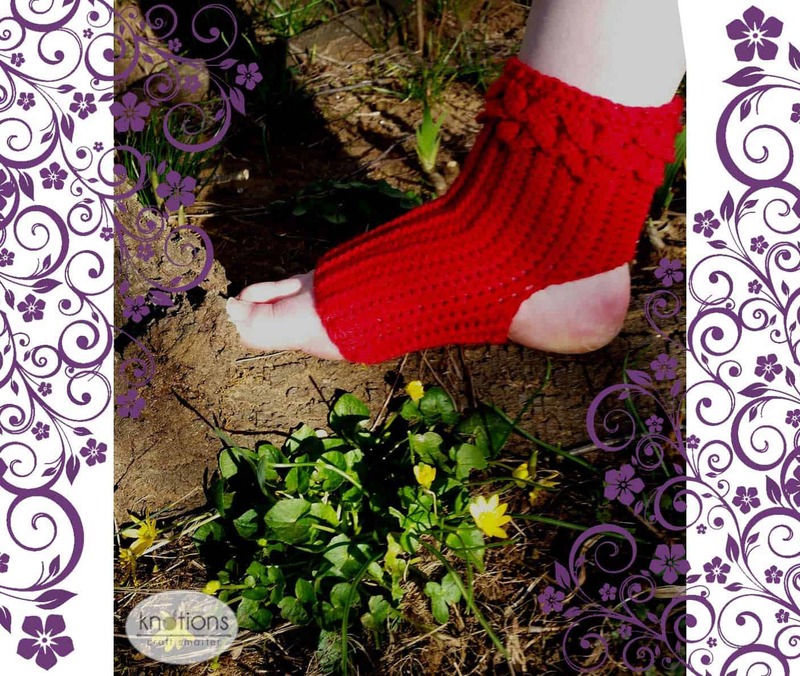 No need for a flowing cape for your Super Hero outfit when you wear these stylish socks! 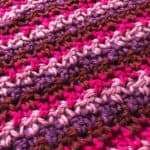 The texture is created using alternating Front Post Double Crochet and Back Post Double Crochet Stitches. The sock is worked from toe to ankle starting with Foundation Half Double Crochet Stitches. Foundation Single Crochet Stitches are worked when the sock turns at the ankle. Three rows of Modified Crocodile Stitches top it off. Pattern is worked in the round. The join at the end of each round of the foot and ankle sections is made into the first stitch, not the chain. 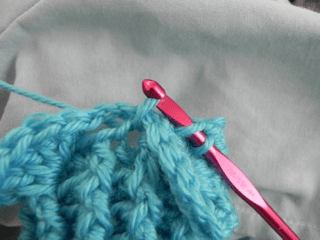 The beginning chain in the foot and ankle sections is not part of the stitch count shown for the rounds. I have chosen to do all stitch work for the crocodile stitches on the right side. 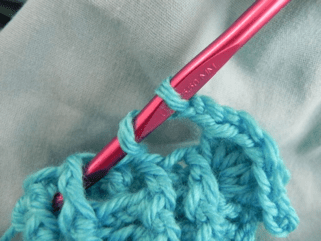 This is different than many videos and tutorials for crocodile stitch on the internet. 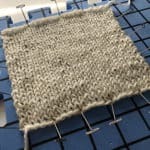 The photo tutorials were made using heavier yarn than called for in the pattern to allow the stitch work to be clearer. The same pattern directions are used to make both socks. 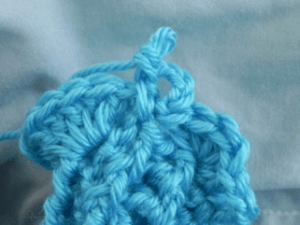 The Foundation Half Double Crochet creates a foundation chain and the 1st row of half double crochet in one step. When pulling the loop up, bring it to the height of the loops already on the hook to prevent the bottom edge of the foundation becoming tighter than the top. 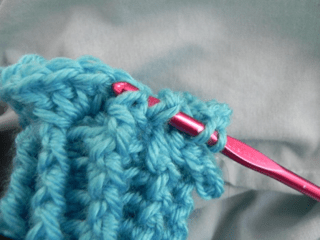 The Invisible Join allows the link at the ends of the row to “disappear” into to the structure of the stitches. 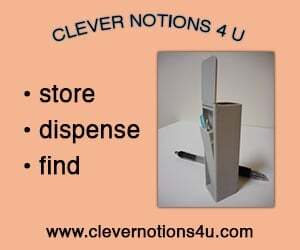 Note: There are two places in this pattern where the Invisible Join is used. 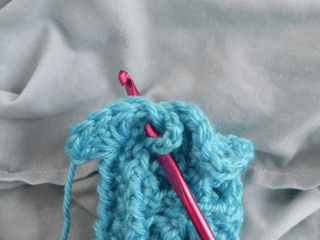 The first is to link the ends of the Foundation Half Double Crochet to complete the beginning of the sock. At the very end of the piece, you need to leave a 4” (10cm) tail to allow the invisible join to occur. Insert hook from back to front under both loops of first stitch of the round; yarn over with the yarn tail and pull all the way through. Insert hook from back to front under back loop only of last stitch of round; yarn over with yarn tail and pull all the way through back loop. Front Post double crochet and Back Post double crochet are worked around the post of the stitch in the row below (instead of into the top of the stitch as done in a “plain” double crochet) to give the ribbed texture of the cuff. Yarn over, insert hook from back to front and front to back around the post of the stitch being worked into (going between the posts of stitches in the previous row), with the hook passing around the front of the post of the stitch; yarn over and pull the loop around the back of the post (3 loops on hook); [yarn over, pull through 2 loops] twice. Yarn over, insert hook from front to back and back to front around the post of the stitch being worked into (going between the posts of stitches in the previous row), with the hook passing around the back of the post of the stitch; yarn over and pull the loop around the back of the post (3 loops on hook); [yarn over, pull through 2 loops] twice. 1st V-stitch round: chain 5, double crochet around last chain and into the top of the beginning chain of the previous row [photo D] (counts as the 1st V-stitch) [photo E]; double crochet, chain 2, double crochet (this is a V-stitch) into the center of next scale [photo F]; V-stitch around the next chain and into the top of the 1st skipped back post double crochet. Continue in round making total number of V-stitches indicated; slip stitch into 3rd chain of the beginning chain. When pulling the loop up to make the ch in the fhdc, I found I needed to pull it up to the height of the loops already on the hook to prevent the bottom edge of the foundation becoming tighter than the top. At this point, I found it most helpful to go back and link the tail with an Invisible Join into the bottom of the last fhdc made. This makes a continuous round for the post stitches to be worked in the next section. 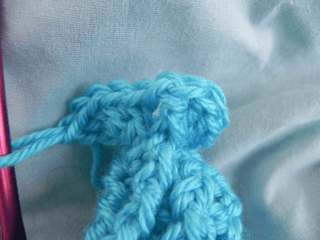 To make the connection smoother, carefully untie the knot from the starting slip knot before doing the join. The foot section has 39 post sts, so each round starts and ends with a fpdc. Even though the ch doesn’t count when counting stitches, it stands in for the “missing” bpdc that would be at the end of the rnd to keep the ribbing even. 3 rows of modified crocodile stitch scales create the top edging of the sock. For the 1st half of the scale, the fpdc are worked around the indicated stitch from top to bottom. 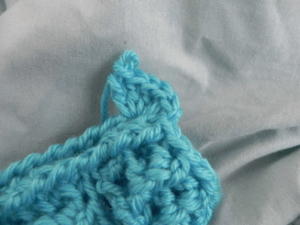 For the 2nd half of the scale, the fpdc are worked from bottom to top around the indicated stitch. The way these stitches are worked, the side that shows at the end will be the wrong side of the fpdc stitches. In the 1st round of crocodile stitches, you are working around post stitches, not V stitches, which is an unconventional way of doing the stitches. Rnd 33: Ch3, work from top to bottom doing 4 fpdc around 1st dc of V-st, ch1, work from bottom to top doing 5 fpdc around 2nd dc-of V-st, [sk next V-st, work from top to bottom doing 5 fpdc around 1st dc of V-st, ch1, work from bottom to top doing 5 fpdc around 2nd dc-of V-st] around, ss to 3rd st of beg ch. Rnd 34: Ch5, dc betw scales and into ch2-sp of V-st below, [V-st in center of next scale, V-st betw scales and into ch2-sp of V-st below] around, ss into 3rd ch of beg ch. Rnd 35: Repeat rnd 33. In rnd 36, the hdc are worked around 2 layers. For the 1st two hdc the stitch is done around the indicated fpdc of the scale and into the ch2-sp of the V-st below the scale; the last hdc is done between the scales and into the ch2-sp of the V-st.
Rnd 37: Ch1, [fpdc around hdc, bpdc around next hdc] around; sk 1st fpdc, invisible Join to top of 1st bpdc. Make a 2nd sock using the same pattern instructions. 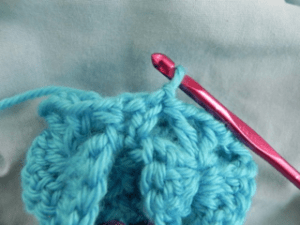 Margo Bauman – aka flyingflower on Ravelry – learned to crochet from her Grandmother. 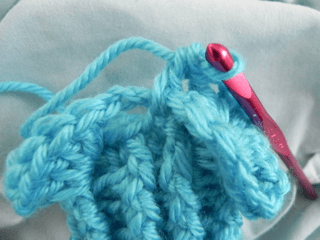 While she occasionally spent some time working on crochet projects while growing up, and later in college, she didn’t devote much time to it until the 2000’s. Since then, she has won a considerable number of 1st place ribbons at the St. Mary’s County Fair for her exceptional work. Her beautiful crochet pieces can be seen at the woman’s cooperative called Fuzzy Farmers Market in Leonardtown MD. Over the past few years, Margo has created a number of original designs. Her very first pattern, Oh, Honey! 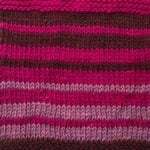 Tunisian Spa Cloth, was released as a free pattern on Ravelry in March 2015. Later that year it was a Crochet Awards (aka the Flamies) Judges Nominee.